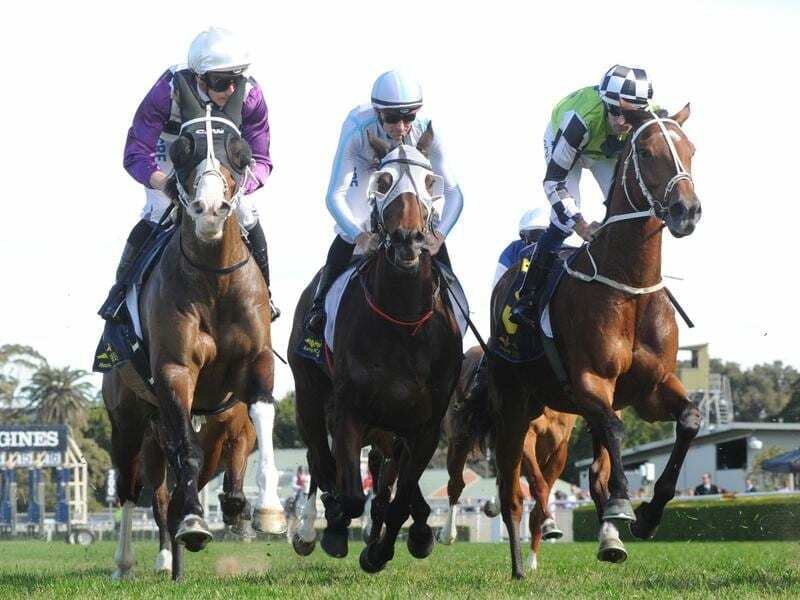 Victorian stayer Red Alto (centre) is being aimed at back-to-back Randwick victories. Red Alto is a challenge for trainer Brent Stanley. The stayer has shown his share of ability on the racetrack, winning six races from 39 starts including three in town and he finished fourth in the Victoria Derby as a three-year-old. But the six-year-old gelding is far from straightforward to prepare. “He’s the hardest horse I’ve ever trained,” Stanley said. Stanley trains at Sutton Grange at a private training facility about 90 minutes from Melbourne where he can also vary the horse’s work to get the required miles into his legs for staying races if he doesn’t play ball on the training track. “I’m lucky I’m on my own property where there’s plenty of acres to do all that because if he was trained in the city he wouldn’t even get to the races,” Stanley said. Stanley believes Red Alto is in the right form and frame of mind for his attempt at back-to-back Randwick wins on Saturday over 2400m. “I’m more than happy with him. I think he’ll run better this weekend than he did last start,” Stanley said. Red Alto faced a field made up entirely of rivals from the Chris Waller stable last start when he fended off a challenge from Vaucluse Bay to win by a head. He was at $7.50 on Thursday for Saturday’s Bob Ingham Handicap with the Clare Cunningham-trained Just Shine favourite at $3.60. Cunningham also has Segenhoe in the race while Waller will send out five of the 11 runners including Vaucluse Bay.